Growing up, the world was black and white. Images flickered softly like ghost negatives on TV. Then something happened. I was too young to remember exactly what, or when. But suddenly everything just turned to color. Ole’ Pa (Wallace Ford): Many a time I’m not on my way till good and dark. 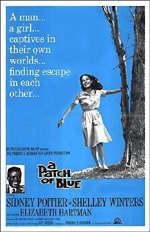 Selina D’Arcy (Elizabeth Hartman): Is that all? Dark’s nothing to me. I’m always in the dark. This was one of the first films that ever moved me. I was (how old?) sitting on the couch with my dad, my mom chain-smoking in her favorite chair with her rattling cocktail glass. My brother lying on the floor as he usually did. This film didn’t seem much like the westerns and courtroom dramas we usually watched—the war films, the musicals. This film was different. It was the young actor, Sydney Poitier. The way he talked. The way he dressed. How he moved. The piercing seriousness of his eyes. He was a sleek Hamlet (even before I know who Hamlet was). But a much smarter prince, a darker knight, world-wise but gentle, a man who—when he spoke—could simply make the wind stop. Could raise the dead. Could heal the sick and tired and all the pretty blind girls sitting alone in all the colorless parks of the world. I remember crying at the end. You weren’t supposed to cry as a kid at movies. Afterwards I never looked at a film the same way again. I still don’t. It was the first time I realized the world was broken, was cruel. The problems of the ’60s raged on. We were sheltered from the riot cities where I lived. Civil rights came and went. Racism never left. But the need for one human being helping another human being still remained. The sky is blue. But we might not know it. At first this film might seem contrived, a black man (Gordon) meets a blind white girl (Selina) in the park. She can’t remember what color looks like. What is green? What is blue? She doesn’t know that the kind man in the park who helps her string beads is “colored”. We all are colored. Stained somehow. The black juice of sugarcane history running down our backs. Gordon shows her the wonders of her city. How to get around. How not to be afraid. How to believe in herself and try to escape the wretched life of living with a prostitute mother and drunken grandfather. Back then we were in a time of change. There was the Mod Squad. There was Julia. All the dark stereotypes now in color! Black Panthers holed up in Chicago. Our neighbors were rolling around outside on the pavement high on LSD. My brother’s girlfriend put a satanic hex on him. He got the mumps. We landed on the moon and shot our heroes dead on motel balconies and all grew up somehow (or maybe not). But back then the rule was black boys don’t touch white girls. Even if only the touch of the heart. We had a lot to learn back then. We still do. The blind lead the bored. And we are all sitting in the park alone somehow. We’re Hispanic. We’re Asian. We’re Islamic. We’re all the dirty colors of the rainbow. If you reach out you can touch them all. Don’t be afraid. They are all bright and beautiful. We just can’t see them.